This photograph provides a measure of how much our style of choosing presidents has changed. In 1904, when this picture was taken, there was no doubt whatsoever of the power of political parties to select their presidential nominees. In the century since, both parties have lost that control. 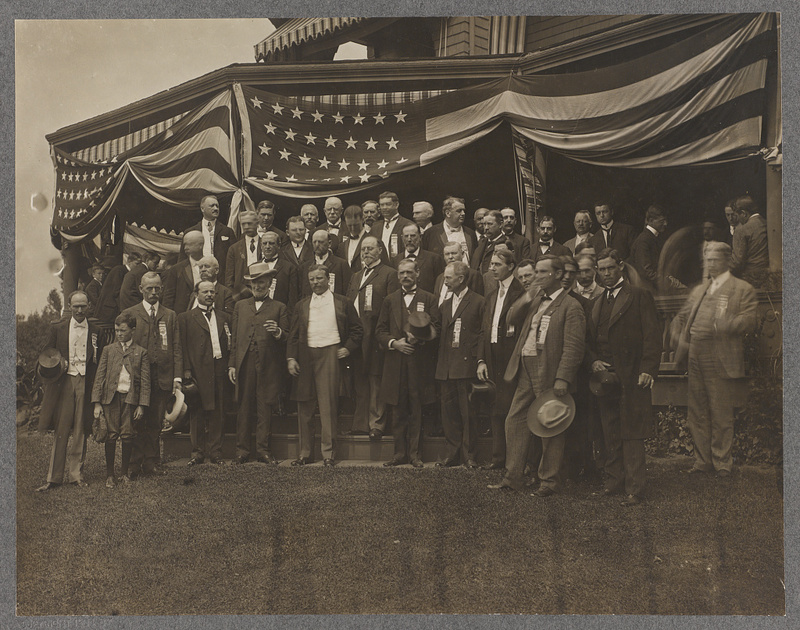 Admittedly, the star of this picture, Theodore Roosevelt (in the white vest), was immensely popular, and the incumbent. His rise had been dependent, however, on his skill in gaining support of the major powers in his party–the political bosses who controlled large blocks of delegates, and the senior officeholders whom the bosses supported. A presidential hopeful had to take into account established figures and personally win them over. The months leading up to a convention were a period of intense jockeying, as hopefuls and their friends made the rounds, trying to gain traction within the organization. No way could a candidate hope to become president without the party establishment, because the power to select a nominee really lay, not with voters, but with their delegates. Young Roosevelt understood that his individual destiny was interdependent with that of the GOP. Early on, he labored to prove his loyalty to the Republican Party, despite his Progressive leanings and reputation for being an impetuous renegade. He recognized that, whatever his personal talents (which proved to be considerable), he needed the vast organizing structure of the party to propel him upward. After angling for years to get the party where he wanted it, the party finally acquiesced. The ritualistic mating game they had played was epitomized in the nominating committee’s formal call on Roosevelt after the convention. They visited Roosevelt at his home on Long Island, Sagamore Hill, where he personally received them and demurely accepted their invitation to be the party nominee. The character of the event was not unlike an at-home wedding. The accommodation that he and his fellow Republicans achieved gave Roosevelt the personal glory he craved, while benefiting the party, which, by organizing itself around Roosevelt, soared to new levels of popularity. In the general election that pitted him against Democrat Alton B. Parker, Roosevelt won every state in the North and the West, including Missouri, which hadn’t gone Republican since the 1860s. His margin of victory was 2.5 million popular votes, the largest in American history. Roosevelt forgot what he knew about interdependence later in life. Having declared that he would never again run for the presidency, he yielded his place to William B. Taft, who retained the White House for the Republicans in 1908. In 1912, Roosevelt made a disastrous decision to run against his party, splitting it and effectively giving the presidency to Woodrow Wilson and the Democrats. It was that party’s first presidential victory since before the Civil War. Roosevelt’s go-it-alone mentality and determination to defy the stolid power of the parties betokened the ill-conceived and divisive presidential bids so prevalent now. Well written article! I so agree with you on every point. I well recall the era when candidates would court the bosses of their party and the bosses, being very shrewd politicians who knew their “areas” well, collectively weeded out the ideologues, choosing the candidate most balanced and able to run and be a President. . . . What is going on within the GOP now is a total joke! Seventeen running and I think the vast majority of them are absolutely not at all qualified to be president. Also, it just scares me to read in the papers what garbage is spewing from their mouths. The lack of attention to what these candidates actually stand for or have achieved (or failed to achieve) is appalling. I appreciate news sources that concentrate on laying out the facts about the candidates. Enough hype already.